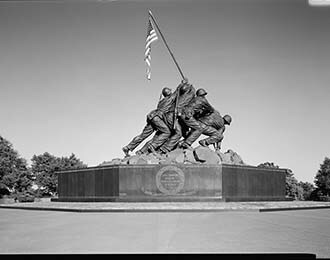 On February 23 1945, Joe Rosenthal took a photograph of five United States Marines and a US Navy corpsman raising the US flag atop Mount Suribachi during the Battle of Iwo Jima; this photograph is now immortalized in bronze as the Iwo Jima Memorial, officially known as the Marine Corps War Memorial. The Marine Corps War Memorial is located on Arlington Ridge, where a panorama of the Lincoln Memorial, Washington Monument, and Capitol Building are visible from its grounds. The base of this memorial bears two inscriptions, “Uncommon Valor Was a Common Virtue,” and “In honor and memory of the men of the United States Marine Corps who have given their lives to country since 10 November 1775.” The memorial is dedicated to all Marines who have give their lives in defense of the United States. The memorial is open from 6 am to midnight, and the US Marine Corps hold Sunset Parades every Tuesday evening throughout the summer.